For the Riesz fractional derivative besides the well known integral representation two new differential representations are presented, which emphasize the local aspects of a fractional derivative. The consequences for a valid solution of the fractional Schroedinger equation are discussed. 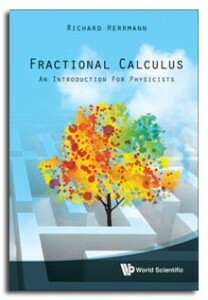 Fractional calculus is undergoing rapid and ongoing development. We can already recognize, that within its framework new concepts and strategies emerge, which lead to new challenging insights and surprising correlations between different branches of physics. This book is an invitation both to the interested student and the professional researcher. It presents a thorough introduction to the basics of fractional calculus and guides the reader directly to the current state-of-the-art physical interpretation. It is also devoted to the application of fractional calculus on physical problems, in the subjects of classical mechanics, friction, damping, oscillations, group theory, quantum mechanics, nuclear physics, and hadron spectroscopy up to quantum field theory. Based on the Riemann- and Caputo definition of the fractional derivative we tabulate the lowest n=31 energy levels and generated graphs of the occupation probability of the fractional quantum mechanical harmonic oscillator with a precision of 32 digits for 0.50 < \alpha < 2.00, which corresponds to the transition from U(1) to SO(3).